Bachelor in Library Science not below 2nd div with computer proficiency . The Ewing Memorial Library at Forman Christian College – A Chartered University seeks the services of Project Librarian (Cataloger) on contract which can be renewed on continual basis, to catalog their Collection. Work requires training and Master level education in Library and Information Science with good typing and cataloging skills. Ability to communicate, analyze and synthesize book data and provide user focused subject analysis. Ability to work in an automated environment. Responsibilities involve, but not limited to the following tasks: a) Perform original descriptive and subject cataloging for library materials such as monographs in English and various subject fields; apply rules of Anglo-American cataloging, Library of Congress cataloging, Library of Congress subject headings, and Dewey Decimal classification. b) Perform origonal data entry in the VIRTUA Online Public Access Catalog database in accordance with the MARC standard. d) Conduct complex searching and researching in English and several foreign languages to establish appropriate form of main entries, added entries and place names; assign main entries and subject headings; determine edition statements, imprints, collations and series notes. Principal Warsak Model School & College Warsak Road Peshawar. Two vacant posts of Assistant Librarians on daily wages. Interested candidates can send their CVs within two days. Applications are invited for the following categories for Superior Grammar School & The Spirit School in all the Major Cities of Punjab. How to Applying for This Position? Please mention the post and the city applied for on the Envelope and in the subject column if apply through email. A private VVIP Airline is looking for qualified and dynamic individuals to be part of the team. We operate a modern fleet of VVIP aircraft including - Airbus A340/RR553, A340/CFM56, A330/CF6, A310/CF6, A320/V2500, A319/V2500 and CFM56, BD700/BR710 and B747 complying with the highest operational standards. A Technical Librarian is part of the QCAA Part-M and QCAA Part 145 Organisation. He/she is responsible to ensure the Technical Publication and Library processes are adequate for providing all technical documents and publications to Maintenance and Technical Control staff to facilitate their duties. Applicants should be experienced in aircraft documentation and library processes with a sound knowledge of aviation and library IT systems. Your tax-free salary includes privileges like furnished accommodation or housing allowance, medical insurance and other excellent benefits. Experience: Having IT qualification to operate/maintain Computerized Library Record. 5 years Experience in a reputable public library haing 15,000 Books. 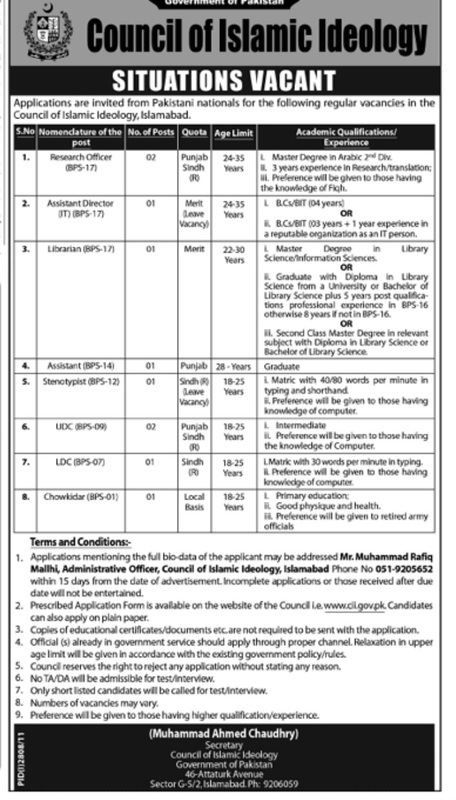 A position of Librarian (Serials and Electronic Resources) is vacant at University of Central Punjab Library. Professionals having following experience and skills may apply on or before 1st Feb at the person undersigned. MLISc (minimum CGPA 3.0) with at least 02 years post qualification experience of working in a reputed library. Hands on work on acquiring and managing print and online serial collection, subscription renewals, cancellations, new orders, invoices, licensing, claim missing issues, etc. Working knowledge of desktop publishing · Good written and oral communication skills. · Ability to meet deadlines for assigned reports and activities. Swedish College of Engineering and Technology (SCET, Wah Cantt. At times, organization decisions can affect the hiring speed of the position you applied for. So you need to remain positive and wait patiently for their decision. If you are shortlisted, the employer will update your application status at www.jobsnama.com, or contact you directly to arrange for an interview. Therefore, check your email regularly and make sure your contact details are up-to-date. Candidate must have M.A Library Science with experience of working with Library Computer Software. IT Skills are a pre-requisite. Lahore University of Management Sciences (LUMS), a premier institution known for its academic excellence, requires committed and component individuals. Candidates must have Minimum Bachelor's Degree in the subject of Library Science. First Class 16- Year degree in Library Science with not more than one 2nd Divisions in the academic career from an accredited academic institution. Two years experience of teaching Library Science or Library works in a University or other national or international organization. College of Physicians and Surgeons Pakistan (CPSP) The college of Physicians and surgeons Pakistan is a premier postgraduate medical institution in Asia. The Role: The role of the Chief Librarian is to plan, organizes and manages the services of the institute Library: establishes goals and measures accomplishments against recognized International standards. Study and make plans to develop the services of the library to meet more effectively for current and future needs for study of medical community and area trends and their relation to the library. Prepares library programs and budgets. Directs a public relations program to promote and publicize the library in medical community. Maintain learning and resources for any new developments in the library science. The Individual: Master’s degree in Library and information sciences with more or at least 10 years administrative experience, including a broad background in management, administration, operations of Medical Library. Good knowledge in digital assets management library systems an procedures (Particularly metadata and cataloging standards), exemplary interpersonal and communication skills, and an understanding of database systems and operation of library collections. 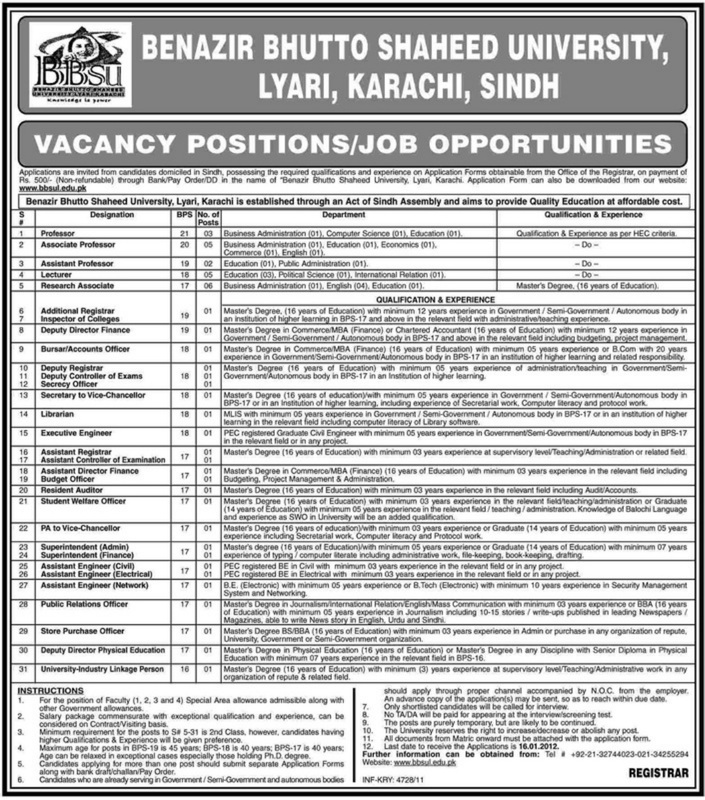 General Manager, Human Resources, College of Physicians and Surgeons Pakistan, 7th Central Street, DHA Phase II, Karachi. Or Email: jobs@cpsp.edu.pk. For apply See Sunday Dawn Newspaper. The candidate will be responsible for Library setting and operations. Preference will be given to applicants who have been associated with the development of libraries in technical subjects and also who have sound and practical knowledge/experience of computer application in the management of a modern library in a highly automated, integrated system. Experience of Web OPAC and latest reference tools. Applications are invited for qualified and experienced O Levels Teachers,Student Counsellor, Science Lab Assistant, librarian and Receptionist. With minimum 5 years of ehttps://www.elance.com/j/looking-librarian-categorize-quality-useful-websites-web-research/27954573/?utm_medium=partner&utm_source=jobrapido&utm_campaign=jobrapido&rid=1YX1Qxperience, candidates must be fluent in English. Montessori Coordinator, Montessori Directress, Admin Executive, Subject Teachers, Librarian and Canteen Contractor. 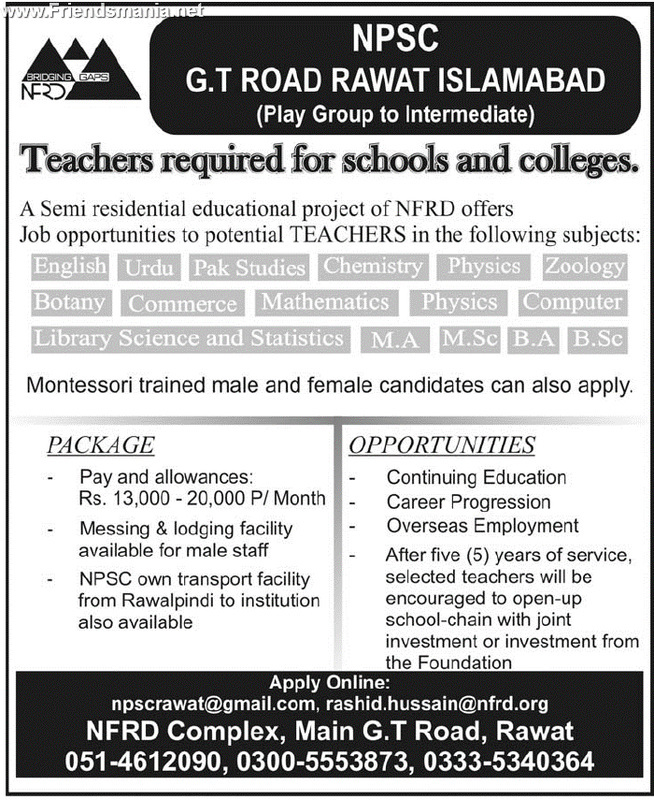 Wanted experienced qualified Sindhi Teacher for Secondary Classes, librarian. Attractive salary package send resume urgently to Bangalore Town School. Academic: Ph.D in the relevant field from HEC recognized University/Institution. Experience: 10-Years teaching/research experience in HEC recognized University or a post-graduate Institution or professional experience in the relevant field in a National or International Organization. 5-Years post-Ph.D teaching/research experience in HEC recognized University or a post-graduate Institution or professional experience in the relevant field in a National or International Organization. Publications: 10 research publications (with at least 04 publications in last 5 years) in Journals recognized by the HEC. Academic: Ph.D. in the relevant field from HEC recognized University/Institution. Master’s degree (foreign) or M.Phil (Pakistan) or equivalent degree awarded after 18 years of Education as determined by the HEC in the relevant field from HEC recognized University/Institution. Experience: 4 years teaching/research experience in a recognized university or a post-graduate Institution or professional experience in the relevant field in a National or International Organization. MLSc/MLIS + 17 years professional experience in Library of repute or Ph.D in Library Science + 10 years professional experience in Library of repute. Requirements: Master Degree in Library Science/Library and Information Science (1st Div) with 10 years service as Librarian in BS-17. • Candidates for the posts of Associate Professor are required to submit five copies of applications along with complete C.V, attested copies of testimonials and research work/publications. • Candidates for other posts are required to submit one copy of application along with complete C.V, attested copies of testimonials. • Candidates applying for more than one post shall submit separate applications with necessary documents, complete in all respects. • The applicants who have already applied for various positions, shall submit fresh applications. Librarian, Rs.500/- in case of others drawn in favour of the Treasurer, University of Sargodha. • Two most recent passport size photographs should be affixed on each application. • Candidates already in service of a Government/Semi-Government Department or an Autonomous Body must apply through proper channel by the due date; otherwise their applications shall not be entertained. • Applications received after the last date will not be entertained; even though posted before the last date. • Incomplete applications shall also not be entertained. 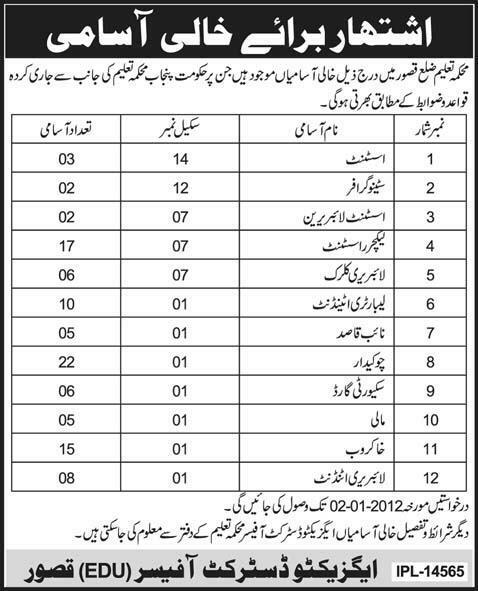 • Last date: For Associate Professor is 16.02.2012. For all others posts is 16.01.2012. • The University reserves the right not to consider any application or fill any post without giving any reason. • Number of posts can be increased / decreased according to the need of University. Required Trained and experienced Female Librarian with Graduate degree. Send your CV with recent snap. MLIS with five years of experience in a University Library. 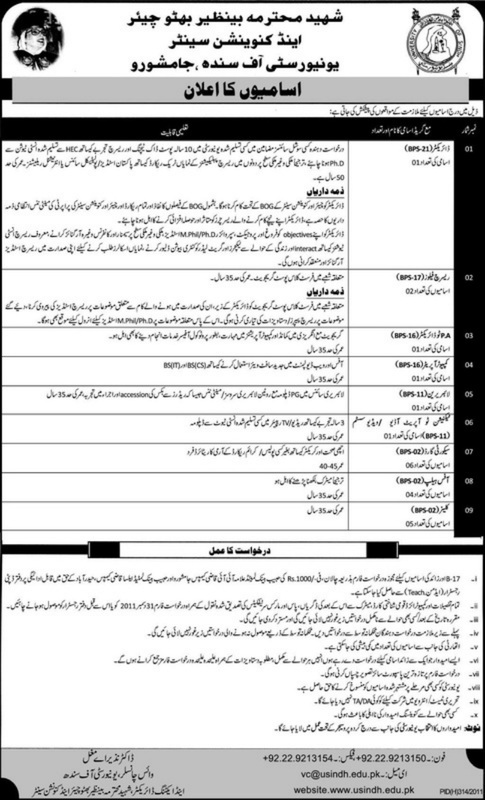 Individuals having experience in use/implementation of computer based information system for publication/literature search will be preferred. Candidates should possess knowledge of KOHA and other latest library management systems. College requires the services of Librarian.